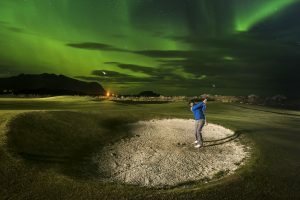 Lofoten Links | Golf and Northern Lights – From August until October! Starting at NOK 3450 per person (sharing a double room). 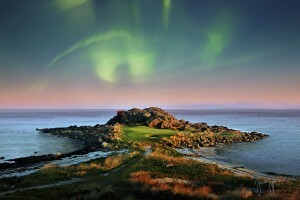 The price includes a rental car, 2 night’s accommodation at Lofoten Links Lodges and 3 rounds of golf (18 holes). Accommodation at Lofoten Links Lodges in double room with hotel standard (Luxury standard Lodge) 2 nights and 3 rounds of golf (18 holes) NOK 3450 per person (in double or twin room). Single supplement NOK 1400,-. Read more about accommodation at Lofoten Links here. Once you have finished your afternoon of golf, you can extend your stay in the clubhouse or at restaurant Låven at Hov Gård (www.hovgard.no) with a good dinner in anticipation of the northern lights. This is one of the better places to experience this wonderful spectacle, with the location directly to the north and the Norwegian Sea, and no disturbance from external light pollution! Please contact us for other offers and further details regarding your trip to Lofoten. We tailor your event, business event or tour to Lofoten, with other experiences as RIB, fishing or Icelandic horse riding available. Arrival by plane to Svolvaer (SVJ), Leknes (LKN) or Harstad/Narvik (EVE). Pick up your rental car at the airport and drive to Lofoten Links and check in at our Lodges at the Clubhouse. Depending on your arrival time you can play round of golf (18-hole green fee included), and the hunt for the Northern Lights can begin! We recommend a visit to the the fishing village Henningsvaer, located about 25 min from Lofoten Links to the golf. 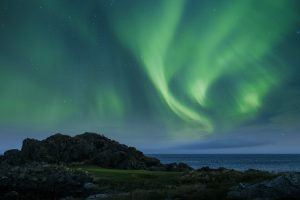 Visit the gallery of Aurora photographer Vidar Lysvold, who will also give good advice and tips for how to take optimal pictures of the phenomenon. After this visit maybe its time for another round of golf (18-hole green fee included). When you have finished the afternoon round, you can extend your stay in the clubhouse or the restaurant Låven at Hov Gård with a good dinner in anticipation of the Northern Lights, as this is one of the better places to experience this wonderful spectacle. The location is directly to the North and the Norwegian Sea, without nearby external light pollution. After breakfast you can do several alternative activities in Svolvær; Nature and sea eagle safari with either boat or RIB to the famous Trollfjord, visit Lofoten war museum showing WW2 from a North-Norwegian perspective or take a ride on Icelandic horses from Hov Farm, next to the golf course and our Lodges. 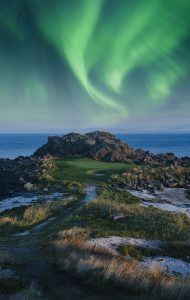 Then, another round of golf in the afternoon (18-hole green fee included), where the hunt for the Northern Lights continues during and after the round. Depending on your departure time, you might like to have another round of golf? Lastly, return to your airport for the return of your rental car and onward journey. Drive to Å at the end of Lofoten, and visit picturesque fishing villages as Reine on the way. Visit the Viking museum «Lofotr» on Vestvåg island. (About 50 min. drive from Svolvaer and 30 min. from Lofoten Links). Take a look at the homepage of the tourist information in Lofoten for alternative activities.